Gregory Crawford, dean of the College of Science at the University of Notre Dame, has written a personal account of his experiences since he accepted the position in 2008. 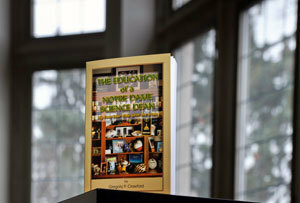 “The Education of a Notre Dame Science Dean: My Four-Year Ride with the Irish,” published by Corby Books, will be for sale Christmas Day. All proceeds support the Ara Parseghian Medical Research Foundation to find a cure or treatments for Niemann-Pick Type C (NPC) disease. Crawford, whose great-uncle Pomp played football for Knute Rockne at Notre Dame, visited Blue-Gold and other games while he was growing up in northeastern Ohio. His boyhood dream of playing for a Notre Dame coach was fulfilled, he says, when he became part of the team that includes the Ara Parseghian Medical Research Foundation in the fight against NPC disease. 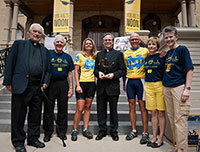 The book details Notre Dame’s relationship with the Parseghian Foundation and Crawford’s three cross-country bike rides to raise awareness for NPC. Other book chapters describe Crawford’s encounters with President Jimmy Carter and President Barack Obama; catching muskie with Rev. Theodore M. Hesburgh, C.S.C., at Land O’Lakes; meeting legendary Notre Dame professors, innovative administrators and inspiring entrepreneurial students; watching a professional football game with Condoleezza Rice and pilot “Sully” Sullenberger; sponsoring the Pink Zone luncheon to honor breast cancer survivors, researchers and doctors; dancing with a professional to raise money for the Center for the Homeless; and participating with Rev. Tom Streit, C.S.C., in the University’s extensive work in Haiti, both before and after the earthquake. The story includes nearly 150 names and diverse locations. “It’s an example of how learning happens not only for undergraduates and graduate students but even for a Notre Dame science dean,” Crawford says. The 200-page book is for sale at the Hammes Notre Dame bookstore and through Corby Books. Originally published by Gene Stowe at newsinfo.nd.edu on December 13, 2012.